Pam, Doug and Adam are moving furniture into the house, Cody and Todd are unpacking. Doug and Adam start wrestling! Pam is pleased Adam is moving back home. As they go outside Cody complains to Todd that Pam is just concentrating on Adam, Todd thinks it will all settle down. Adam comes in briefly but heads off to collect his things; Pam takes Doug into the bedroom. CODY: I've got a question, what if I was pregnant? 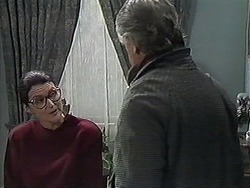 Dorothy is upset as Ryan comes home from a sports game, she tells him that Clarrie has left and that he pushed Helen over. She then says that he broke her ornaments, the emergency fund has gone and there are wine stains on the carpet. Ryan says that was all him, due to his party, he wants to replace the emergency fund money. Annabelle comes in and Ryan leaves to look for him in her car. Melanie, Chrissie and Caroline, they are discussing Caroline's night out with a client but nothing happened. Paul comes in complaining about Clarrie and he has a headache. Melanie is here to do her washing as there is no room in her new flat for a machine. Adam comes round to collect some things for his chauffeur job. Melanie railroads Adam into a date, Adam doesn't seem too keen though and the twins aren't happy. Doug wants to know if Cody is pregnant and she isn't. Cody says there is a friend at school that is pregnant and she wants to know about adoption. Pam starts to tell her about a friend she knew at the hospital, she had her child adopted. Doug and Todd go to unpack more boxes, Cody asks more questions about the mother and the child, Pam says she regretted it. 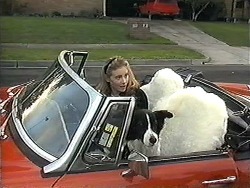 Annabelle and Ryan pull up alongside Clarrie; Ryan says Dorothy knows about the money. 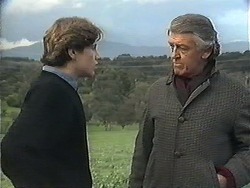 He tries to persuade Clarrie to come home, he doesn't want to but he agrees to eventually. Annabelle won't let Rosie into her car, so Ryan tells her to drive off and she does. Clarrie says Ryan is better off without Annabelle but he isn't sure. Dorothy is on the phone looking for Clarrie when Ryan and he return. 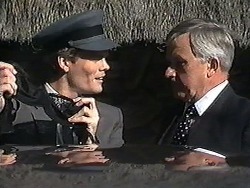 Dorothy apologises for accusing him of taking the money. Clarrie says he will forgive but not forget. Dorothy then criticises him for allowing Ryan's party but he says Ryan needed some fun as Dorothy gives him no freedom, he leaves to find Helen. 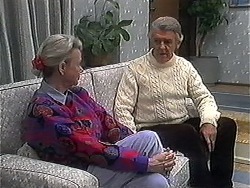 Dorothy asks Ryan about Annabelle but he says he doesn't want to talk about it. Adam is unloading his car which turns out to be Home James' limo; Helen comes over to introduce himself. Helen mentions that he is using it for his own personal use; Adam says Caroline wouldn't mind and Helen tells him she owns Home James! She agrees to forget about it and leaves. As Adam continues unloading he drops a bottle of chemicals in the car, it seems to be a fairly strong chemical as Adam has a coughing fit. Dorothy is talking to Ryan about his party and taking the money, she says he only did it to impress Annabelle; Ryan disagrees as Annabelle turns up at the door. Annabelle wants Ryan to apologise, he says he will no longer try to impress her, he can't afford it, and Annabelle says it's his loss and leaves. It turns out Adam spilt chloroform in the car, he has the room Cody wanted so she as a strop about being ignored. CODY: I always come last in this family and now I know why. Adam pulls up outside the hotel, his client has fallen asleep so Adam wakes him, he comments on a funny smell, as Adam reaches in to find the client's briefcase he discovers a bra! The client is less than impressed. Dorothy is here to apologise about upsetting Clarrie which caused the argument. Clarrie then arrives and Dorothy leaves. They discuss the incident and he apologises which Helen accepts. Adam is here to show Paul the bra which Chrissie and Melanie find hilarious as the bra is Caroline's! She tries to think of some excuse but everyone just laughs. Cody wants to go to the address on the letter but Todd thinks she is being very hasty.